All of our April Showers did bring May Flowers! I could not help but use some on my table before I planted them outside. 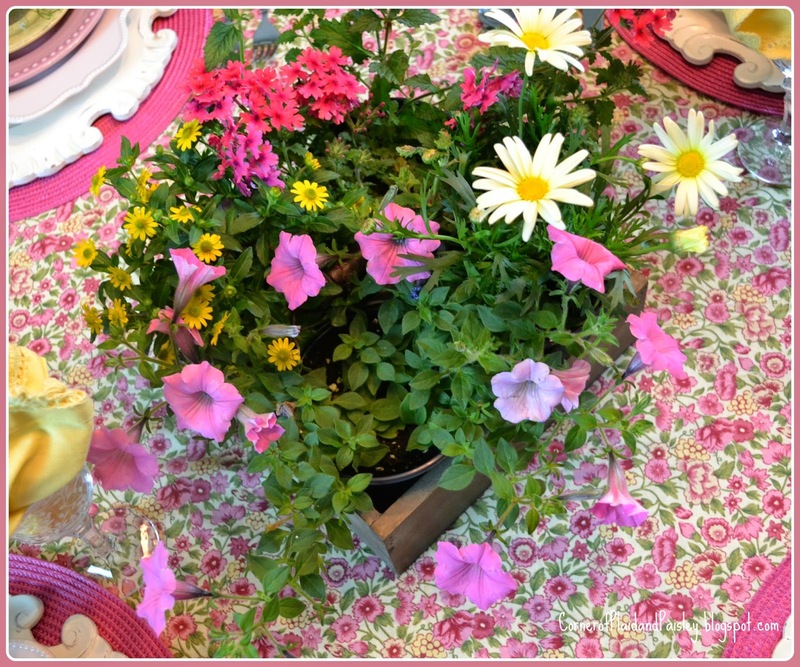 I had this beautiful April Cornell yellow and pink table cloth that I bought a while back, I kept thinking of it as I was roaming the nursery and choosing flowers. When I got them home, the table just fell in place. Just a pretty mix of pink and yellow! I am glad my flowers took a day or two to rest on my table before going outside, because I am sad to report that since planting my flowers that a good portion of them became bunny food just after I planted them! Sometimes I think it is unfortunate that my dog has taken such a liking to all the bunnies in our yard! I hope you are able to stop and enjoy some of the flowers around you! Your tablescape looks really lovely. 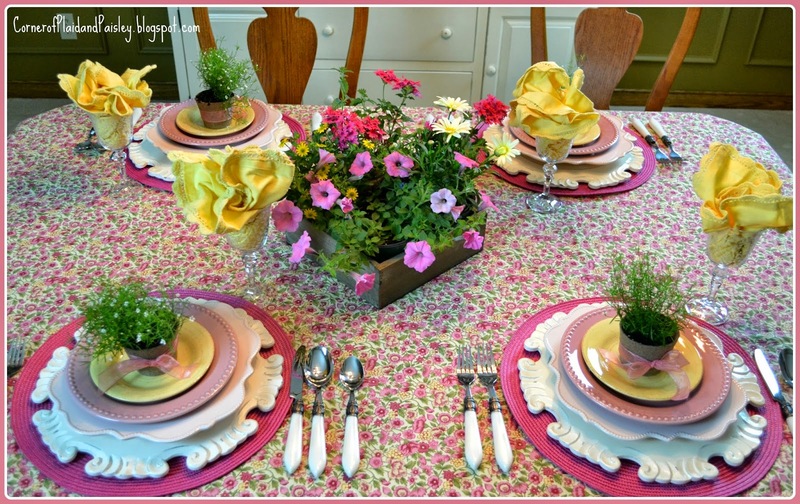 I like your flower arrangement and it goes so well with tablecloth and dishes. Oh so sorry that the bunnies ate your pretty flowers. Hi, Ann! 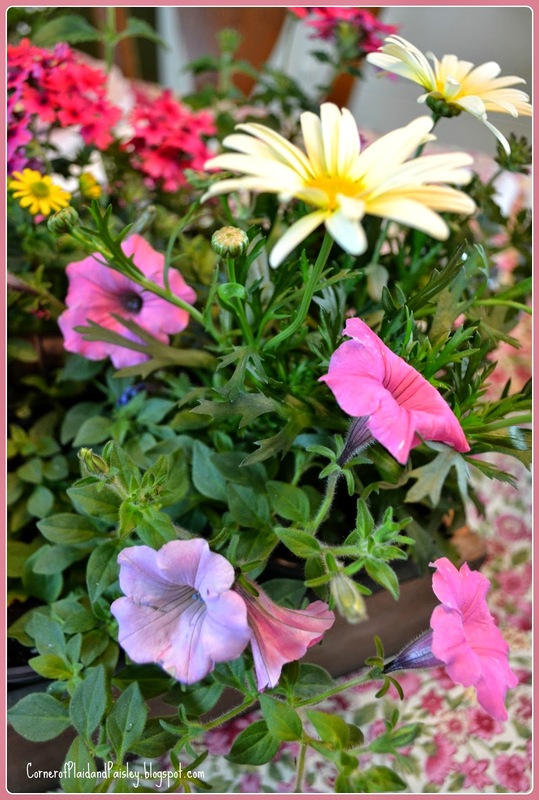 So a trip to the flower nursery got you totally inspired, huh? I love it! That's the way to do it! I'm really impressed that you could pretty much see the tablescape right off the bat. That almost never happens with me! You did an outstanding job, and it's cool that you were able to get double-duty out of the flowers you bought for your yard. They REALLY go well with the tablecloth!!! I'm watching Dancing With the Stars tonight and hoping on the one hand that Amy wins, but then on the other that Meryl wins. They're both really good. This has been a fun season! Have a great holiday weekend, and enjoy those flowers! While Amy and Derrick have done some extraordinary things this season! I am in love with Meryl and Max!!! I am right there with ya!! Oh, love your May flowers! This is a delightful table, Ann. Your flowers are perfect with the April Cornell cloth. I often like to buy blooming plants to use inside, then move them out to the garden a bit later. Sorry the bunnies ate them. I love the colour combo you used of pink and yellow! 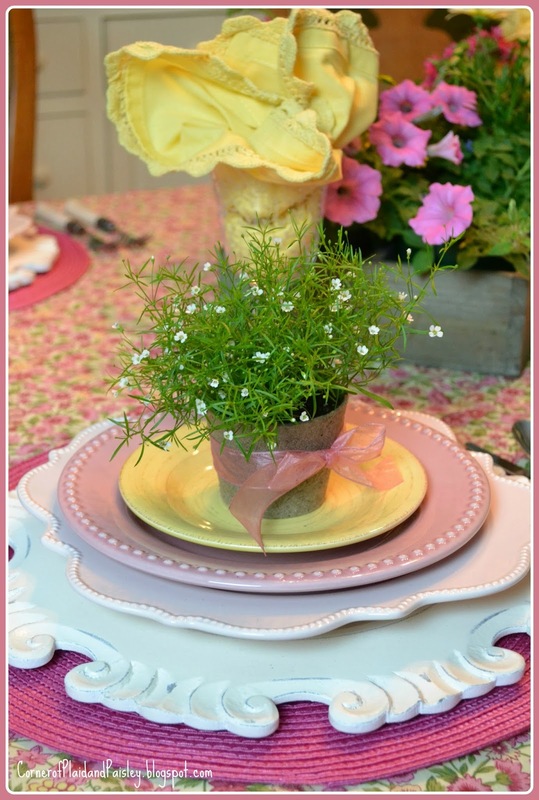 Your pre-planted flowers made the perfect centerpiece and love the little pots of baby's breath. Bunnies for you, deer for me! They ate every single tulip I had - so frustrating! Oh how pretty! 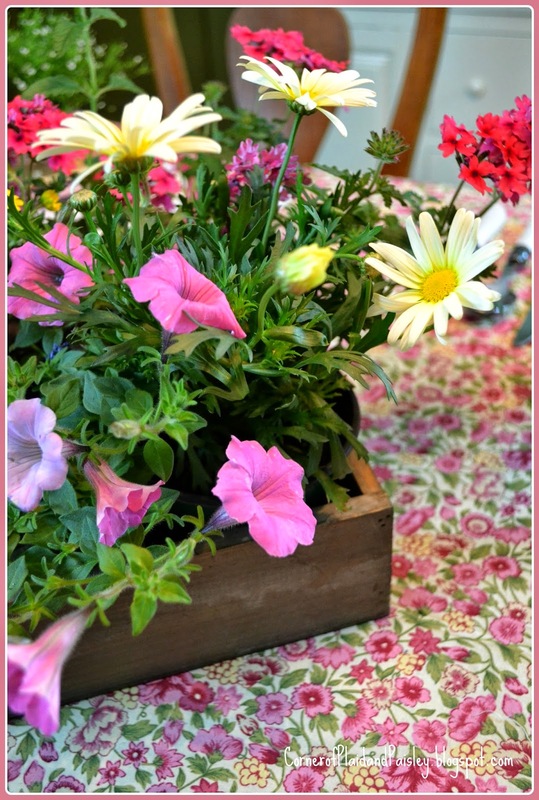 What a great idea to use your annuals for the centerpiece arrangement! I already planted mine! Love that tablecloth and your dish stack! Come on summer- bring it on! 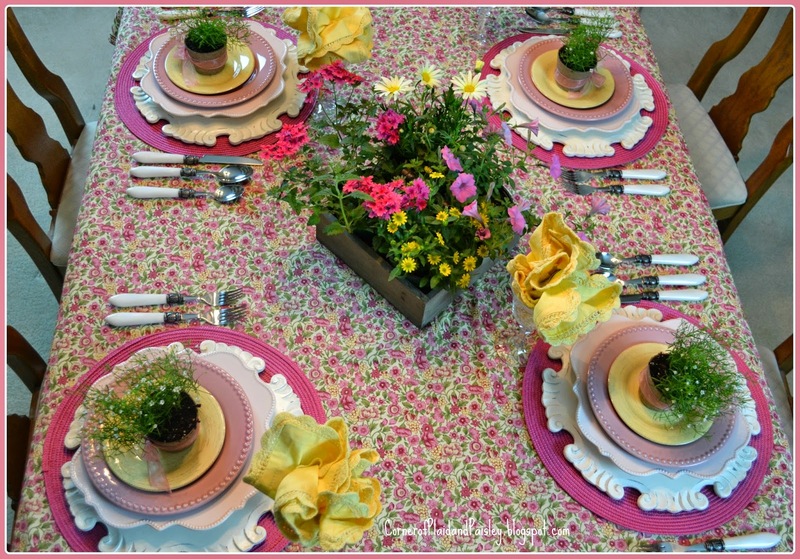 Such a beautiful spring table setting! Your tablecloth is so cheerful and ties everything together so nicely. Thanks so much for stopping by my blog. I wish I could offer some assistance with your hydrangea blooms. Hopefully this year with be your year to get lots of flowers!! Love the pink and yellow brightness! Looking at this table just makes me smile! 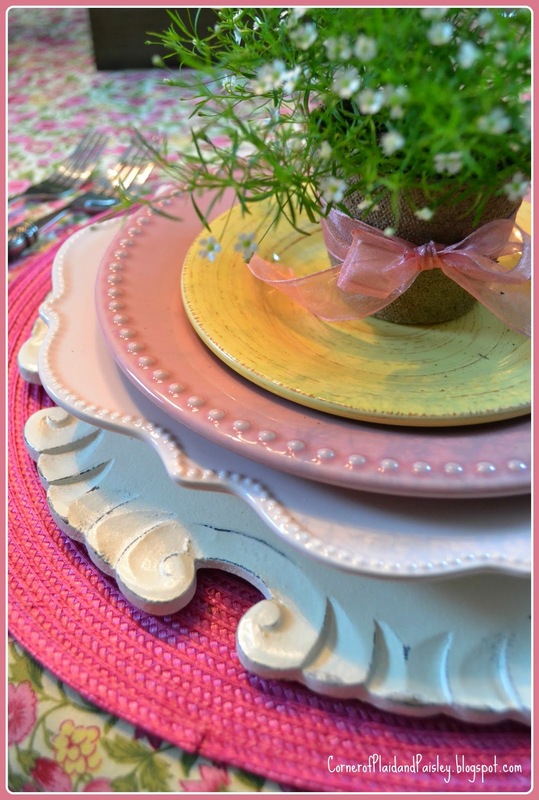 Love your plate stack too~isn't it fun when the table just sort of happens?!! Ann, I can certainly understand why you were thinking of this tablecloth, when you were visiting the nursery! It is flower heaven! 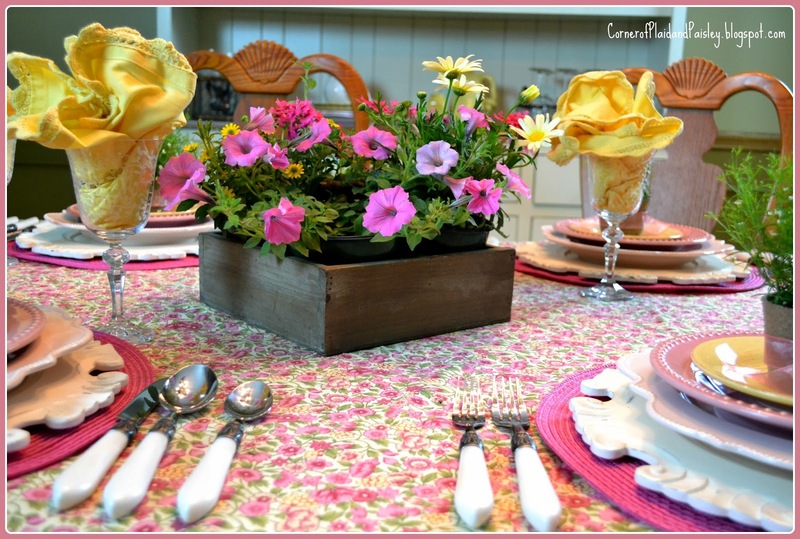 I love your color choice of the placemats - so perfect as a backdrop for the rest of the tablescape. What a happy table - one could never get depressed looking at it!!! Love this. I applaud you for staying on task in the garden section and picking the perfect flowers. Sorry about the bunnies, that must be so frustrating. Lovely tablecloth...just beautiful and I love the way your plate stack complements it perfectly. Great summery table!